A STORYTELLING BOARD GAME SET IN THE 1970s COLD WAR ERA. SMERSH is a portmanteau of two Russian words that translates to "Death to Spies." It operated as a counter-intelligence agency by the Red Army during the 1940s. Despite having had a large number of paid employees, little was known about the agency until recently when Russia opened their archives. Agents of SMERSH is a cooperative Storytelling game that pits players as UN Secret Service Spies set in an alternate 1970s timeline against a newly formed and independent SMERSH. 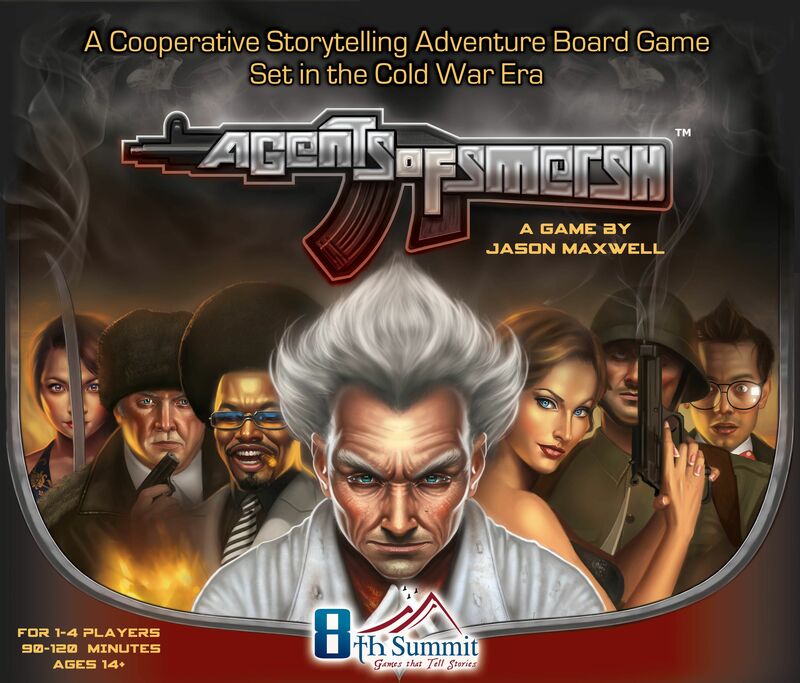 Agents of SMERSH includes custom dice to determine success or failure of encounters, and more strategic play from what is typically expected of a Storytelling board game. There are plenty of James Bond gadgets, guns, cars, pop references and detailed artwork - not to mention a touch of humor. The game features the artwork of George Patsouras (The Resistance & Flash Point). The game is able to accommodate play with either The Encounter Book, which contains over 1500 written encounters with a similar reaction matrix to Tales of the Arabian Nights - or played more simply with only encounter cards with shorter encounters and no matrix. The First Edition (2012) of the game came with the Encounter Cards as standard, and the Encounter Book as an optional add-on (although many copies did actually include the book). The Second Edition (2015) includes the Encounter Book as standard, with the Encounter Cards available to purchase from the publisher.